Dirigold bronze flatware is a line of forks, knives, and spoons. To preserve and properly care for the bronze utensils, they should be hand-washed immediately after each use. Never allow food or liquid to sit on the flatware, or stains can form, which can be extremely difficult or impossible to remove. 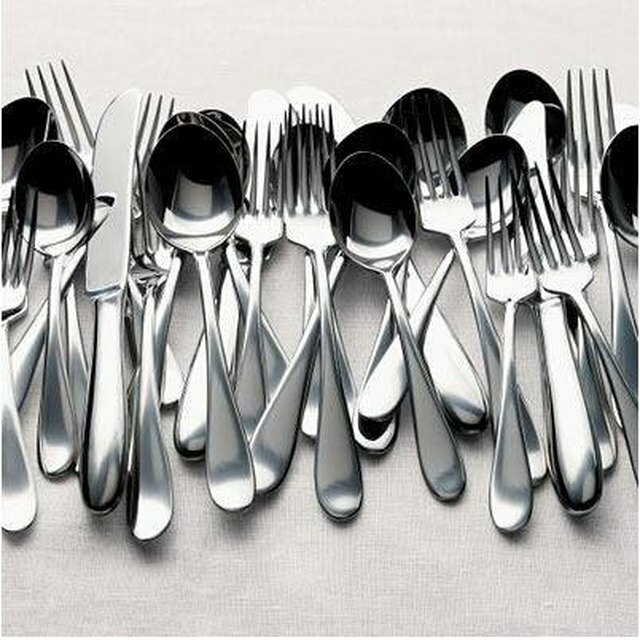 Between uses, the flatware should be stored in a chest or wrapped in a dry cloth to prevent tarnish from forming. Apply a dime-sized amount of bronze polish to a polishing cloth or soft rag. Rub the polish into the Dirigold bronze flatware until the item is completely covered in a thin layer of polish. Allow the polish to sit on the bronze flatware for the amount of time specified on the manufacturer's directions for the brand of bronze polish you are using. Typically, this is 10 to 15 minutes. Use a clean, soft cloth to wipe away the polish in a circular motion. In addition to removing the polishing, you are buffing the flatware. Repeat the process, if necessary. If the flatware is tarnished or stained, it may take several attempts to restore the shiny finish. Fill a sink with room temperature water and a squirt of a mild, liquid dish soap. Dip a soft cloth into the soapy water. Wipe the bronze flatware to remove all polish. Rinse the flatware under cool, running water. Dry the Dirigold bronze flatware with a soft towel to prevent water spotting. Never use chemicals or solvents, such as bleach or ammonia, to clean the bronze. It can cause discoloration and eat away at the bronze. Never use abrasive cleaners, such as cleaning brushes or steel wool, because these can scratch the bronze finish.